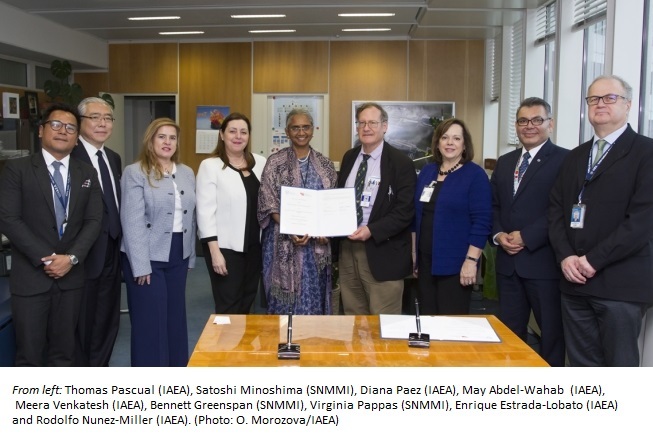 The Society of Nuclear Medicine and Molecular Imaging (SNMMI) and the International Atomic Energy Agency (IAEA) have established practical arrangements to cooperate on extending the reach of educational materials for nuclear medicine diagnostic and therapeutic applications. The agreement was signed at the 30th Annual Congress of the European Association of Nuclear Medicine (EANM) in Vienna, Austria, on October 23, 2017.
facilitate the broadcasting of live web-streaming seminars on topics in nuclear medicine and molecular imaging. Such cooperation across borders improves healthcare around the globe. 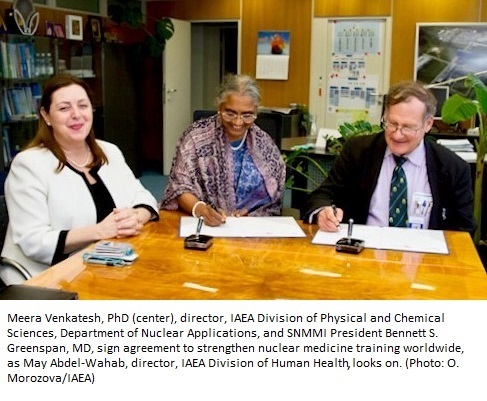 SNMMI welcomes this opportunity to work with IAEA and share knowledge. Please visit the SNMMI Media Center for more information about molecular imaging and personalized medicine. To schedule an interview with SNMMI leadership, please contact Laurie Callahan at (703) 652-6773 or lcallahan@snmmi.org.